Lovely Singapore week. The first week spent in Singapore in what feels like a very long time. Breakfast at a new local cafe, Merci Marcel, with two lovely girls from Sydney, one of them a close friend and the other one her friend visiting. Wine nights with Danish and English friends. My favourite barre teacher’s Birthday party at Sugar Hall. Listening to the Danish Prime Minister discuss the questions – What are the required skills of the future? and Which impact will automatisation and digitalisation have on the labour markets? at INSEAD. On 1 December, we eat sago porridge with cinnamon and mango and listen to jazzy instrumental Christmas music. S is not a big fan of Christmas; I have tears in my eyes because I won’t be going to London and Denmark for the holidays this year (I made a choice; I stand by my choice; my family is happy and healthy at home; I am excited about celebrating Christmas in India with our Indian family; my parents will join us on the 28th; and next year, we will go to Europe for the holidays). Haha. He smiles at me and my nostalgic, sentimental Christmas memory stories, gets me a real Christmas tree from the flower market and decorates the whole house with pine twigs. Very sweet 🙂 From my mum, we get an organic tea advent calendar and Moomin mugs to drink it from. At night, we walk along the river, eat oysters and drink champagne someplace downtown, walk back home to watch Suits on Netflix (we are as captivated as anyone by Meghan Markle these days, since her engagement to Prince Happy was announced on Monday… and we watched her UN speech on Tuesday…). 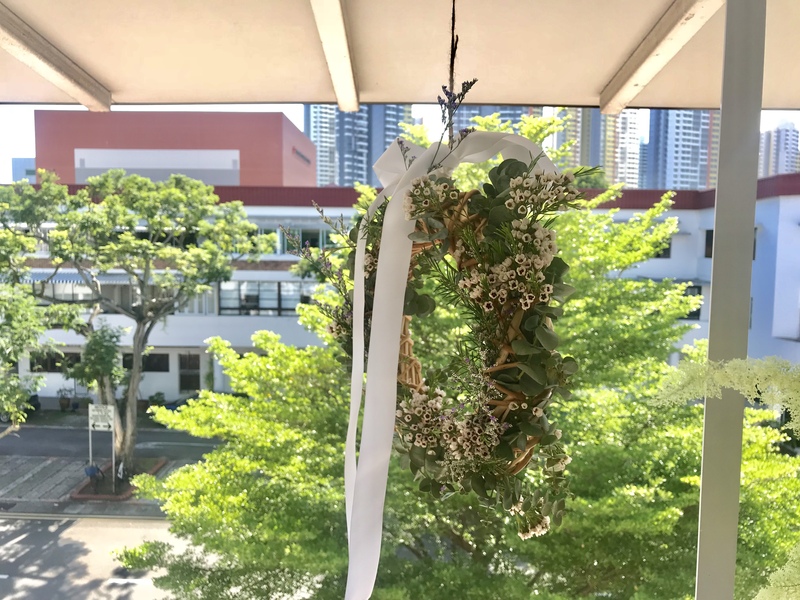 On 2 December, my friend Anna and I go to the flower market to buy all of the foliage and dried flowers we can carry – to make Christmas wreaths in her cosy kitchen. After that, I go to one of the very many hairdresser salons that have popped up in Tiong Bahru recently and have them chop off 30 centimeters of my hair. After that, I go for a long bicycle ride, and then join my boyfriend for a suit and silk dress Founders’ Ball at 1880 – read this and this article.